DC's Legends of Tomorrow provides a smooth and easy to follow the storyline, the cast meshes and seamlessly works together. This is a family friendly television series that uses history, science, and sci-fi to provide a lot of conversation once the episode airs. When I was little, Warner Bros. to me was Bugs Bunny, Daffy Duck, and the Road Runner. Saturday morning cartoons were funny, comical, and maybe even a bit serious. I can still remember the cartoons ending with Bugs bursting out saying, "That's all folks" while the caption underneath read "Warner Bros. Cartoon". When Season One of DC's Legends of Tomorrow finale aired, I heard Bugs in my head saying "That's all folks" to some incredible characters and was saddened that a change in the guard was going to happen. Fast forward to the Season Two premiere (you can find my review here) to find almost all of the characters MIA, including our beloved Captain Rip Hunter - and those words reverberated through my head again- and my heart just dropped inside my chest wondering if we were in for a complete cast change and the loss of our Captain. Why?- do you ask? Let's face it- having the Waverider without Captain Rip Hunter (Arthur Darvill; Doctor Who) is like having the TARDIS with the Doctor. Hunter, who is a future Time Master, travels back (in Season One) to the 21st Century to assemble a band of mismatched self-proclaimed "Legends" to help him kill Vandal Savage, who has killed his family. The Waverider is Rip's (stolen) ship and he is the Captain of his crew. Without him, the crew is destined to fall apart- or is it? I'd have to say that the first few episodes of Season Two gave the impression that there would be mutiny on board of the Waverider once the crew was reunited from all areas of time, from the Dinosaur age to the present, in their search for Captain Hunter but the characters soon settled in and became acclimated to their new roles on board the ship. The journey through time to find Captain Hunter takes the crew back in time to visit many historical events and luckily, the new guy on board, Dr. Nate Haywood (Nick Zano; The Final Destination) is a historian. Turns out, not only is he helpful in navigating past events and time streams but becomes a Legend in his own right, constantly putting himself in the past of danger to save his new friends. Caity Lotz (Arrow) plays Sara Lance, who has been part of the Legends since the beginning of Season One. As mentioned above, it took the crew a little bit to settle in and too soon realize that without Rip Hunter, next in command to take charge would be Lotz' character. I feel like her role was definitely expanded upon and her limits tested this season. Like a true Legend, she performed as she should have, even in times when she had her loyalty and emotions tested in a way in which no one should have to be subjected. In Season One, Hunter visited 2016 to put his crew together. Lance changes it up a little bit by inviting Vixen (Maisie Richardson-Sellers; Star Wars: The Force Awakens) from the 1940's to join her crew after the Legends work with The Justice League. Vixen is a well-placed addition and adds a good mix to the series. She calls upon animals to provide her with power and like Nate, who provides a new friend for his male counterparts; Vixen provides a good balance for Sara, even though they seem to disagree on many things. Vixen has a different way of approaching the messes the Legends get themselves into and provides another perspective for the audience to consider. Wentworth Miller (Supernatural) was our famously bad guy from Season One, playing Captain Cold, who wasn't so cold at the end, sacrificing his life for the teams. The writers were definitely able to fill what could have been a huge void by Miller's departure from the series, but they were able to bring Season Two together from the very beginning until the end, even bringing Captain Cold back to taunt his best friend, Mick Rory (Dominic Purcell; Prison Break) and team up with some very bad guys, towards the end of the season. Speaking of bad guys, I cannot say enough positive things about the crossover events and the crossover characters between all the DC shows on the CW network, including, Arrow, The Flash, and Supergirl. But I think that watching how our Legends interact with Merlyn (John Barrowman; Arrow); Damien Darhk (Neil McDonough; Minority Report); and Reverse Flash (Matthew Letscher; The Mask of Zorro) while chasing the Spear of Destiny almost the entire season brings a fresh look to this young series that shows just how much creativity the writers can bring to Legends of Tomorrow, even without Captain Rip Hunter- although when you think all hope is gone, we end with peace and love in the 1960's! I've written a lot about the actors and characters in general, but let's specifically discuss the storyline and plot. As mentioned above, the Legends are off to find the Spear of Destiny before our most beloved villains find it. Episode after episode runs ins and near misses between the two groups almost make me feel as if I am watching a group of gangs fight for territory and never knowing what is going to happen. Just when you think the Legends are gaining territory, the Villain's regroup and vice versa. Overall, the initial storyline of Legends versus Savage has seamlessly developed into something different, but related, and even more interesting – and mature- than the first. Beginning with the season's first episode, with Oliver Queen (Stephen Amell, Arrow), Nate, and Sara trying to piece everything together, to the development of having to find a new Captain, and to face that there can be only one possible Captain, until the end of the season, each character is developing their sense of who they are and how their actions affect everyone around them. There is a continuous development of a sense of responsibility throughout the season without ever losing the innate qualities that make Legends such a great show. Every episode just folds over into each other that the entire season has a smoothness to it that is quite enjoyable so that when the real battle for the Spear of Destiny occurs, it hits you with that wow factor you knew was coming all season long. 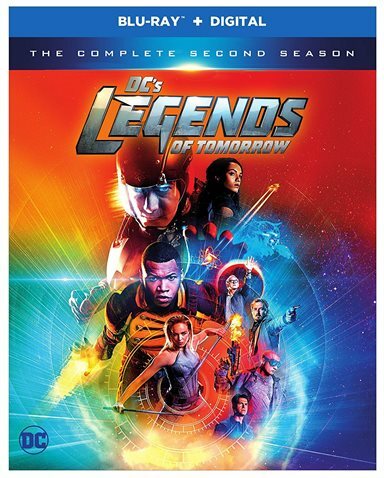 DC's Legends of Tomorrow comes with three Blu-rays that house the entire season and the special features. Presented in 1080p High Definition 16x9 with an aspect ratio of 1.78:1, the picture quality is wonderful. Background colors pop when needed and Nate's superpower gleams and reflects at every turn. Whether it's natural scenery like pre-historic times, the Civil War, or in a dark dismal vault, the colors are crisp and clear. Following in the footsteps of the Season One Blu-ray, Season Two seems a bit clearer and brighter from what I remember during the regular season viewing. The sound is presented in DTS-HD Master Audio 5.1 and provides a good mix of dialogue and background noises. Everything, for the most part, during the season is well balanced and not overpowering. I enjoy being able to hear all the dialogue without the special effects drowning them out. Special features on the Blu-ray include nine deleted scenes embedded in the episodes from which they came, the crossover events with CW counterparts, Arrow, The Flash, and Supergirl, as well as 2 Featurettes- 2016 Comic-Con Panel and Allied: The Invasion! Complex Unaired Scenes-, as well as a Gag Reel. I probably can't emphasize enough just how much the crossover events bring to the series. Warner Bros. knows what its audience wants to see. If you hadn't guessed from my review, DC's Legends of Tomorrow is one of my favorite shows on television. The writers provide a smooth and easy to follow the storyline, the cast meshes and seamlessly works together. This is a family friendly television series that uses history, science, and sci-fi to provide a lot of conversation once the episode airs. For the adult viewers, Legends is entertaining and captivating and for the younger audiences, it creates a lot of questions and discussion once the episode has aired. Someone once told me that if you create something that makes people of all ages have a conversation about it, you've succeeded in creating something great. Congrats, Warner Bros. - because if that is the standard, you've created a Legend. Download DC's Legends of Tomorrow: The Complete Second Season from the iTunes Store in Digial HD. For more information about DC's Legends of Tomorrow visit the FlickDirect Movie Database.